Eco Modern Bread Case - Cal-Mil Plastic Products Inc.
Showcase your freshly baked goods and breads with this beautifully made eco-modern bread case! It features a metal frame accompanied by an accent of bamboo to freshen things up. 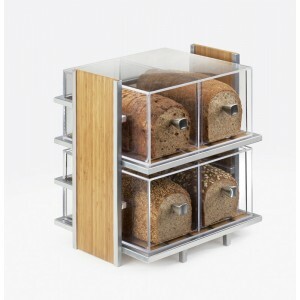 This bread case is the perfect way to brighten up your cafe, bakery, or food service area! Two Each 2 Drawer Bread Boxes Included.